The second Beast Deity Cup and fourth Laketown Vanguard Championship both finished on the seventeenth, with each tournaments' respective top 2s filled by Nova Grappler cardfighters using the new Ultimate Raizer Mega Flare builds from VG-BT16: Legion of Dragon and Blades, released in Japan last Friday. Each tournament had a strong turnout, and their Raizer champions were followed closely by Thing Saver Dragon cardfighters whose decks may give some insight into what kinds of build broke first and second in the recent FR2014 Tokyo regional. In addition to the 48 persons that preregistered, sixteen more registered on-site for the Beast Deity Cup, bringing the final turnout to 64 persons. The fourth Laketown CS (also branded as the fourth Fireball CS due to the hosting party) saw 38 persons preregister, but made accommodations for up to 68 persons and final attendance is not known. Beast Deity champion Silver Crow built his strategy around smoothly developing a fast and early Legion attack with Mega Flare; with the support of the Screamin' and Dancin' Announcer Shout and Energy Charger he could quickly card change out his six draw triggers while building advantage with Charger and putting cards into the drop zone to activate Legion with. 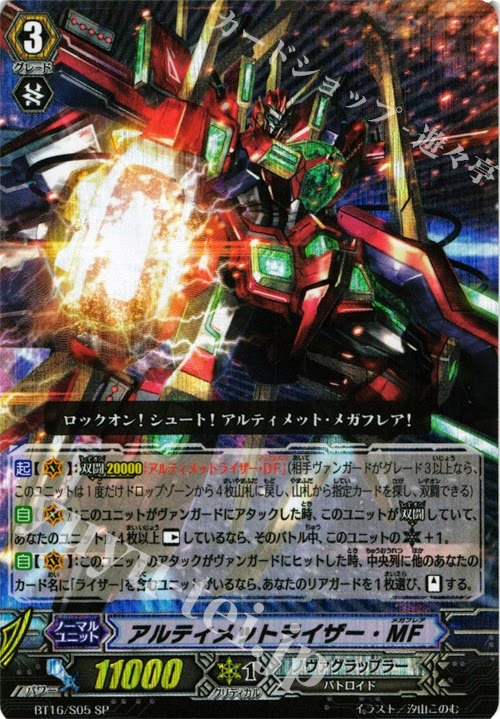 Mega Flare's Legion 20000 triggers its autoskill, which gives it an extra critical if there are four units at rest when it attacks the vanguard--including the entire Legion pair. The bigger picture surrounding this is the synergy between the Nova Grappler Legions and Cat Butler, a grade 0 printed back in December 2011 in VG-EB01: Comic Style Vol. 1. 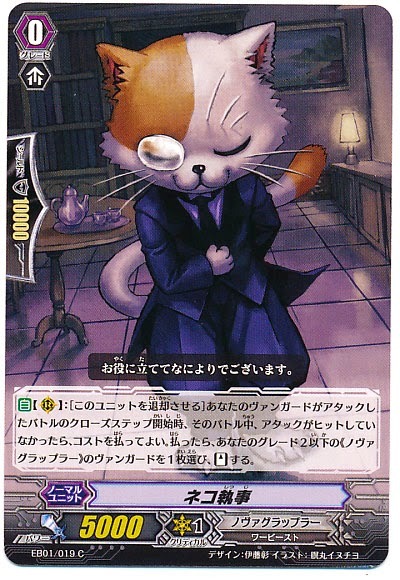 Cat Butler's skill can stand the vanguard by retiring himself if the vanguard is a grade 2, and immediately after Bushiroad representative Doctor O confirmed via Twitter that this was valid with Legion skills, the card drew widespread attention both in Japan and overseas. As Cat Butler's retire is effectively a -1 to receive a second twin drive and neither Mega Flare nor Butler are constrained by limit break, this allows for a fast and early +1 increase in card advantage that comes coupled with additional critical and aggressive sweeping attacks. 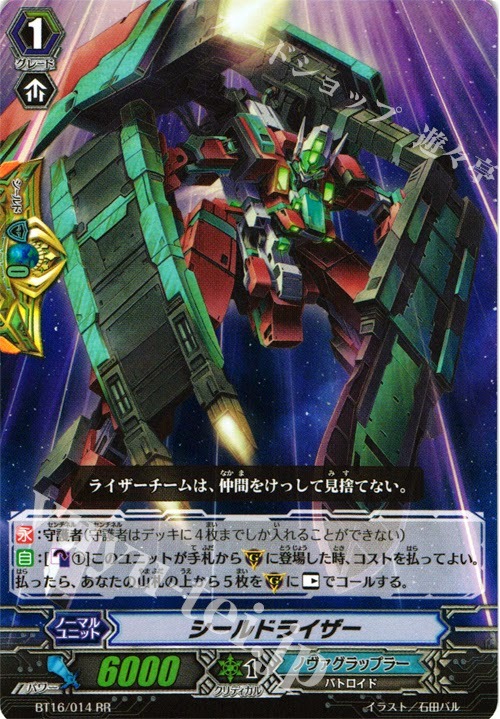 As Ultimate Raizer MF only requires four units to be at rest for his critical to kick in, Silver Crow also made use of the grade 2 Street Bouncer to build his advantage further early on, giving up a rearguard attack in order to draw a card and improve consistency while still maintaining the vanguard's dangerous Legion skill. In an unexpected twist, both of the Beast Deity Cup finalists run four of the Nova Grappler Quintet Wall, Shieldraizer, completely abandoning perfect defense cards for the first time in the history of professional play. The low counterblast cost of the Raizer deck and the need to set up an early Legion functions well the early use of Quintet Walls as a quick way to prep Legion in advance. While the pro reception of Quintets ranged from lukewarm to negative when they first debuted in VG-BT14: Brilliant Strike, Legion has made the likes of Shieldraizer and Gloria commonplace among professional cardfighters. More surprisingly still, Silver Crow's decklist used just five grade 3s in order to accommodate maxing out Cat Butler at 4. The fourth Laketown/Fireball CS decklists are not currently available, but the top ten are known to contain 5 Nova Grappler, 4 Royal Paladin and 1 Link Joker decks, with Raizers making first and second place. The previous Laketown CS is generally regarded as the origin point for the proliferation of Star-vader “Ω” Glendios in Japan following VG-BT15: Infinite Rebirth. The first Beast Deity Cup meanwhile is attributed with being the inspiration for many of the competitive Dragonic Overlord “The Яe-birth” decks.